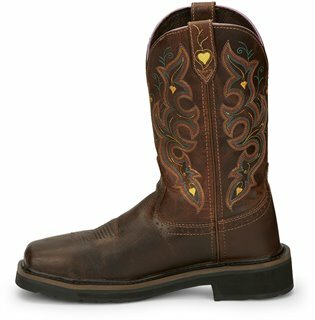 The Sunney Comp Toe 11-inch tall Women's work boot is delicately feminine yet durable through even the toughest work conditions. 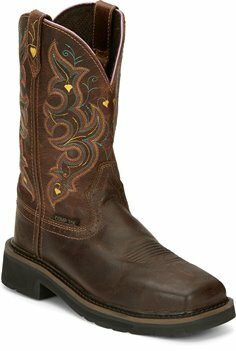 The rich brown leather exterior is slightly distressed giving this boot a lived-in look and is decorated by a red, turquoise, and yellow-heart stitch pattern and a lilac trim on the collar. Its round composition toe provides an armor-like shield for the metatarsals and meets safety standards without weighing you down. The J-Flex Flexible Comfort System® insole cushions and supports the foot and the Stampede™ rubber and EVA combination outsole with resistance to abrasion, chips, slipping, and marking which allows you to comfortably work on any surface.